Junior Will Schaefer finished fifth in Division 2 at 195 pounds at the WIAA Individual State Wrestling Tournament in Madison over the weekend. 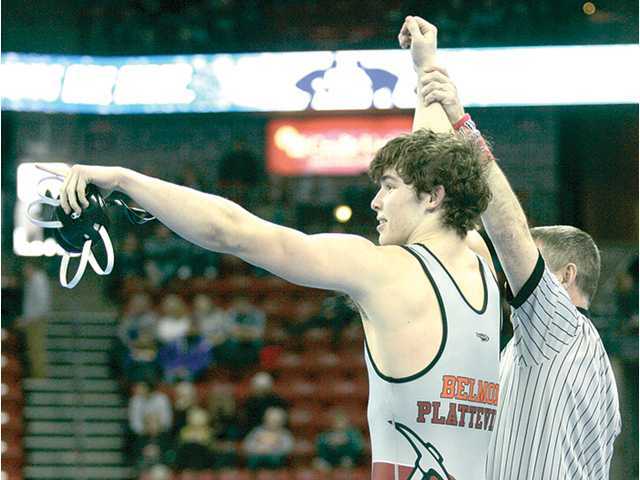 POSTED February 27, 2019 1:11 p.m.
MADISON — Emeric Williams’ first season as Belmont/Platteville’s head wrestling coach came to an end Saturday after a successful showing at the WIAA Individual State Tournament at the Kohl Center. Junior Will Schaefer wrestled his way to a fifth-place finish at 195 pounds in Division 2, while sophomore Michael Douglas went 1–2 at 285 pounds and gained valuable experience that will serve him going forward. Schaefer (43–6), ranked fifth entering the state tournament, made his state tournament with a first period pin of Grafton’s Alec Davis in Thursday night’s opening round. He then suffered a quarterfinal loss to eventual state champion Stephen Buchanan of Neillsville/Greenwood/Loyal before Friday morning before bouncing back with a 7–0 victory in the consolation round later in the day. Then after, a 5–4 loss to Campbellsport’s Matt Koebl Saturday morning, Schaefer capped his state tournament run with a pin of Ellsworth’s Logan Melstrom in the fifth-place match. Douglas (36–15) opened his first state tournament with an 2–1 overtime victory over Wrightstown’s Ethan Witcpalek Thursday night, but unfortunately suffered a concussion just 45 seconds into his quarterfinal match against eventual state champion Logan Zschernitz (46–0) of Spencer/Columbus Catholic Friday morning. Douglas had to forfeit the match, as well as his consolation match later that day. Looking back at his first year as head coach, Williams is happy, but by no means satisfied. “During my first season as head coach, we had 247 individual varsity wins, and 142 of those wins were bonus point wins,” said Williams. “We had five sectional qualifiers, two state qualifiers, and one state place-winner. The kids bought in to the new coaches from day one and it really showed all season long. With only nine or 10 kids in the varsity lineup consistently, we were still competing for team trophies every weekend. Top 10 team scores — 1.Luxemburg-Casco 84, 2.Two Rivers 64, 3.Ellsworth 60, 4.Freedom 49, 5.Wrightstown 48, 6.River Valley 37.5, 7.Baldwin-Woodville 36, 8.Jefferson 34, 9.Nekoosa/Assumption/Port Edwards 32, 9.Spooner/Webster 32, 9.Viroqua 32. D2-195 — Will Schaefer (43-6) placed 5th and scored 12.0 team points. D2-285 — Michael Douglas (36-15) place is unknown and scored 2.0 team points.